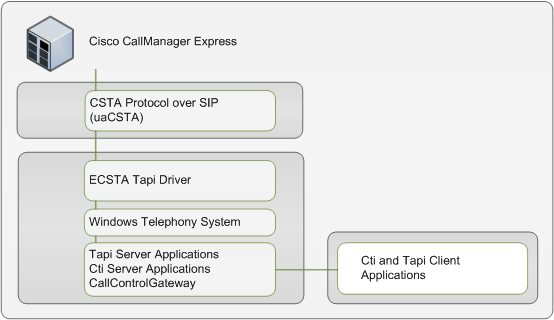 estos ECSTA for CallManager Express makes available a Telephony Service Provider for Microsoft® Tapi 2.1 (also 2.2 and 3.0). This Tapi driver establishes a central communication between a PC (CTI Server) and the telephone system. On this CTI server all devices on the telephone system are available as Tapi lines. All estos ECSTA for CallManager Express drivers use the efficient interface CSTA in order to communicate with the telephone system. For the installation and management of the driver see driver Management.